To effectively manage resources, decision makers require timely information at an appropriate scale. In the recent years there has been a marked increase and uptake of remote sensing technologies – drones, LiDAR and satellite imagery. In a sense, they all have a place provided they are cost-effective, provide consistent results, and add value. Not to go unnoticed is the increased availability of Earth Observation (EO) data and advances in technologies that allow cost-effective, repeat assessment of forest resources. The two main catalysts have been the launch of more satellites and the development of cloud-based processing engines, enabling the development of near real-time monitoring applications. Pete leads a specialist resource monitoring team at Indufor, with overall responsibility for business strategy, growth and development. His expertise includes operational use of satellite imagery, with a focus on monitoring land use and change at local and national scales. Pete is actively involved in projects that use satellite imagery to monitor the environment, forest productivity, harvesting and tropical deforestation activities. Since 2013, he has been retained as a technical advisor to the Norwegian Space Centre to assist with the development of forest change methods and evaluating emerging satellite systems. This work is coordinated across several agencies including the Norwegian agencies (MFA and NICFI), FAO, USGS and the University of Maryland. He received his PhD and MSc (Distinction) in forest monitoring from Durham University, England (2005), and his BForSc from Canterbury University, New Zealand (1993). Digital agriculture, or ‘Precision Agriculture’ (PA), provides various technologies to improve decision making in the land-based primary production processes. When agricultural production regions start introducing such PA-technologies, the adoption rates are typically low for a long time before they increase. Besides lack of regional evidence of benefits from PA, a critical initial barrier is insufficient data about variability, where and to what extent do growth-potentials vary over a paddock. A prominent example of PA is applying the amount of inputs like seeds, fertiliser, or water for crops according the spatially variable requirements from growth of arable, pastoral, horticulture/viticulture crops across a paddock. Zoning the paddocks according yield performance (based on ‘yield maps’) is a traditional approach, but requires historical yield data. These are mostly not available when farmers intend to start with PA. Remote sensing data from aerial platforms or satellites (e.g. archived images in geo-databases) in combination with proximal data (e.g. maps of soil properties) can provide valuable information for preliminary zoning of variable paddocks. The presentation will show examples how publically available data from remote sensing, together with proximal data of the paddock can be used to create initial zones that correspond well with harvested yields. We will discuss current options and future R&D-need to provide such initial solutions to lower barriers in PA-adoption. Since 2013 Armin is managing the Precision Agriculture Science group at Lincoln Agritech (LAL), a subsidiary of Lincoln University in New Zealand. With his team, supported by the other scientists and engineers at LAL he is researching and developing digital technologies for primary industries (‘Precision Agriculture’, PA). Armin initially developed his key research activities at the University of Bonn, Germany in the area of agronomy, mainly on decision support systems for crop production. He studied processes and drivers in yield physiology, crop growth modeling and arable cropping systems. From 1992 until 2012 Armin was head of the Institute of Land Use Systems at the Leibniz Centre for Agricultural Landscape Research (ZALF) in Germany. There he worked on optimising cropping systems for changing economic and ecologic frame conditions, targeting innovations for sustainable development in agricultural land use. Armin has worked in research on Precision Agriculture for almost three decades. He headed several collaborative R&D-projects for PA in Germany and the EU. His training as a researcher on crop production and agronomy as well as his involvement in sustainability research at the landscape level allows him to conduct interdisciplinary land use research. Armin is keen to support the development of new technologies in land use for New Zealand and international markets. These should provide farmers with highly productive and environmentally friendly agricultural production systems. Amongst the interdisciplinary projects, Armin and his team just finished an MBIE-program on developing sensor-based decision support systems for improving nitrogen management of intensively grazed dairy pastures (OPTIMUM-N). In an MBIE-Program on Precision Grape Yield Assessment, the team develops optical and microwave sensing technologies for assessing and managing the variability of grape vine crops. Armin is contract-PI of a Robotic Spearhead project of the National Science Challenge 10 (Science for Technological Innovations). This project paves the scientific grounds for small, highly adaptable and flexible robots as well as robots in hazardous and changing environments. Armin is teaching a Precision Agriculture course at Lincoln University and was appointed Adjunct Professor at that University. In Oct. 2017 Armin chaired PA17, the International Tri-Conference on Precision Agriulture in Hamilton, New Zealand, hosted by the Precision Agriculture Association New Zealand for more than 500 delegates. LIC and FarmShots (USA) have co-developed an algorithm that converts satellite imagery of New Zealand farms into paddock-specific dry matter readings. Traditionally, farmers measure pasture by walking the farm, which is time-consuming and laborious. It is recommended that to optimally manage pasture, farmers need to measure the availability in each paddock every 7-10 days. Advancements in satellite technology have seen increased frequency of satellite passes over New Zealand. Now satellites are taking images on a daily basis which increases the probability of getting a cloud-free image to farmers at least every 7-10 days. LIC has just commenced a commercial release in Canterbury, and are also working to validate the algorithm for other regions, as well as potentially developing algorithms for other supplementary feed crops. This technology provides farmers with a convenient alternative to farm walks as well as providing a consistent method of measure. Simon’s role is to identify, evaluate, scope, model and implement new and profitable business ventures for LIC. The identification and development of commercial opportunities can come from either inside LIC itself or from other companies and start-ups. Simon is LIC’s representative for the Enterprise Angels early-stage investment network. Prior to joining LIC, Simon worked as a Business Development Manager at AgResearch for 5 years focussed on the dairy sector. He also worked in the UK for 10 years as a medical research scientist and an investment banker. Scion has been working with Satellite imagery for forests since the 1970’s. This talk will provide information on how high resolution imagery is currently used in forestry for management and research. Bryan Graham is the Science Leader for Forest Informatics at Scion, where he leads a team focused on how Scion and the forest industry respond to the opportunities, and challenges, created by digital technology. In his role, Bryan has negotiated the sale of Scion’s commercial software division, established a world leading UAV programme, and built an informatics team focused on Remote sensing, Bio-Informatics, Computer Science, and Data Science. He recently commissioned NZ’s largest capacity Bio-Informatics server and a new platform for large scale geospatial data processing. Bryan is an advisor to Plant & Food Research’s information steering committee, which focuses on digital challenges for horticulture, is a member of the executive committee of the Bay of Plenty Institute of Directors, and a director of the Waikato Bay of Plenty Magic netball board. Carbon dioxide uptake by New Zealand’s forests and other land regions offset nearly 20% of all greenhouse gas emissions under the Kyoto Climate Treaty, and forest carbon credits are likely to play a crucial role in meeting our obligations under the Paris agreement. Yet, it is difficult to accurately quantify the amount of carbon absorbed by forests, grasslands, and other ecosystems. Observations of atmospheric CO2 and other greenhouse gases are now available from satellites, and these new datasets provide a potentially powerful tool to validate national greenhouse gas inventories. Dr Mikaloff-Fletcher will present results from a prototype study based on atmospheric data, which suggests that New Zealand’s land biosphere absorbs more carbon than previously thought. This work is primarily underpinned by measurements at the surface, but the available remote sensing data products and how they might be used to improve New Zealand’s carbon budget in the future will also be discussed. Dr. Sara Mikaloff-Fletcher is a carbon cycle scientist at NIWA. Her work focuses on using atmospheric and oceanic data and models to understand greenhouse gas emissions and natural carbon sinks, which slow climate change. Dr Mikaloff-Fletcher earned her Ph.D. at the University of Colorado, Boulder, and held positions at the University of California, Los Angeles and Princeton University before joining NIWA. In addition to her role at NIWA, she serves as Editor of the peer review journal Global Biogeochemical Cycles. Biological systems are inherently variable. Differences in soil characteristics and micro-climates in crop paddocks can lead to differences in crop growth, resulting in variation in plant growth characteristics, incidence of pests, diseases and weeds, and ultimately difference in crop yield and quality. Farmers can measure the variation in soil characteristics using geospatial soil surveys, and crop yields using harvest yield monitors that measure geospatial yield. This information can then be used to generate Management Zones (MZ) that allow us to practice Site-Specific Crop Management by applying variable rate applications of seed, lime, fertiliser, irrigation, plant growth regulators and pesticides to optimise crop profitability in each MZ. However, this system is based on the use of historical data, rather than real time information, and doesn’t account for variation in the current season’s crop. The use of sensors during the crop growth season allows the in-season tailoring of the applications of crop inputs to the crops actual requirements, and can therefore influence the growth of the crop. This approach also minimises the waste of crop inputs, and the detrimental environmental effects of applying excessive crop inputs such as nitrogen and water. Real time crop data can be obtained from machinery mounted sensors, UAV’s, or from satellite imagery. Machinery mounted sensors require a pass over the crop to be undertaken, and UAV flights, over large areas of crops, requires specialist equipment, is time consuming and require discipline to undertake at regular intervals. FAR is currently investigating the use of satellite Earth observations to provide crop data to enable real-time decisions to be made in growing crops. Any delivery of satellite data needs to be seamless and in a format that can easily mesh with existing farm management and mapping software systems, and be useable in environments with slow internet connection speeds. 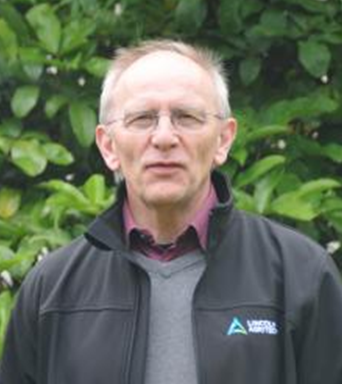 Allister Holmes, Research and Extension Team Leader, joined FAR in 2014 and is based at the FAR Ruakura office in the Waikato. Allister has a background in maize, cropping and horticulture research and agronomy. Allister manages the FAR precision Agriculture programme and is currently managing a four-year Sustainable Farming Fund Project titles “Transforming Variability to Profitability”. Allister uses geospatial data obtained from soil tests, harvester yield monitors, as well as aerial images from both UAV platforms and satellites. Many growers have embraced some aspects of precision agriculture (auto-steer and section control), but few are using data driven technologies to undertake Site Specific Crop Management. This SFF project aims to develop simple ways to integrate geospatial soil, plant and crop harvest characteristics to analyse profitability, and aid in decision making processes to improve profitability in future years. This will reduce the amount of wasted inputs entering the environment, as well as maximising profit. Allister holds a Bachelor of Horticulture and a postgraduate Diploma of Agricultural Science from Massey University where his dissertation was completed on germination enzyme activity in barley. Allister began his cropping career with Corson Grain in Gisborne, working in maize and sweet corn research and production. He also worked as an agronomist for Heinz-Watties and Cedenco Foods in Gisborne, planning and implementing crop supply programmes with pea and sweet corn crops, and for PlusGroup in Tauranga, leading their research programme. Multispectral satellite data and its interpretation has the potential to provide an efficient, environmentally friendly, socially acceptable and inexpensive method to map, study, and explore New Zealand’s mineral and geothermal resources at a reconnaissance scale. In particular, the method can potentially help reduce the area of interest for follow-up exploration by ground-based methods. A pilot study was conducted at locations of known orogenic gold mineralisation and geothermal activity using WV-3 (Visible, NIR and SWIR) imagery over 100 km2 for two sites: Macraes Flat and Rotorua-Tikitere geothermal field. The use of remotely sensed satellite images to study surface geology for exploration or mineral mapping of geothermal areas is not new and had been done previously with sensors such as Advanced Spaceborne Thermal Emission and Reflection Radiometer (ASTER) at 30m spatial resolution. In a New Zealand context where the vegetation cover is a significant impediment to these predecessor satellite detectors, the application of satellite technology for mineral mapping had been limited. The availability of extended multispectral data from the WorldView3 (WV-3) satellite at higher spatial resolution; however, has made it possible to apply remote sensing for mineral mapping in areas with high vegetative cover. The study has focussed on producing 12 mineral maps related to orogenic gold deposit formation at Macraes Flat in the Otago schist area. Likewise, a mineral map of the Whakarewarewa-Arikikapakapa geothermal area in Rotorua is produced showing the occurrences of silica sinter and kaolinite at the larger areas. In addition to this, The Spectral Geologist (TSG) software was used to examine the reflectance data from the WV-3 satellite imagery and the hyperspectral field validation measurements. There is a general agreement between these two data sets. This highlights a strong potential to develop a new tool around mineral identification for orogenic gold exploration in Otago and geothermal fluid characterisation around Rotorua. Dr. Salman Ashraf has been associated with GNS Science since early 2012. He received his Ph.D. from the University of Waikato in 2011 where he researched on image fusion methods to aide spectral classification for submerged aquatic vegetation. He has taught Remote Sensing at Auckland University of Technology (AUT) in 2011. After completing his M.Sc. (Space Science) from the University of the Punjab, Pakistan in 1995, he worked with reputable international institutes as a GIS/RS Analyst at International Water Management Institute (IWMI) - Sri Lanka, Environmental Research and Wildlife Development Agency (ERWDA)-UAE and as GIS Lab Manager at World Wide Fund for Nature (WWF) - Pakistan.